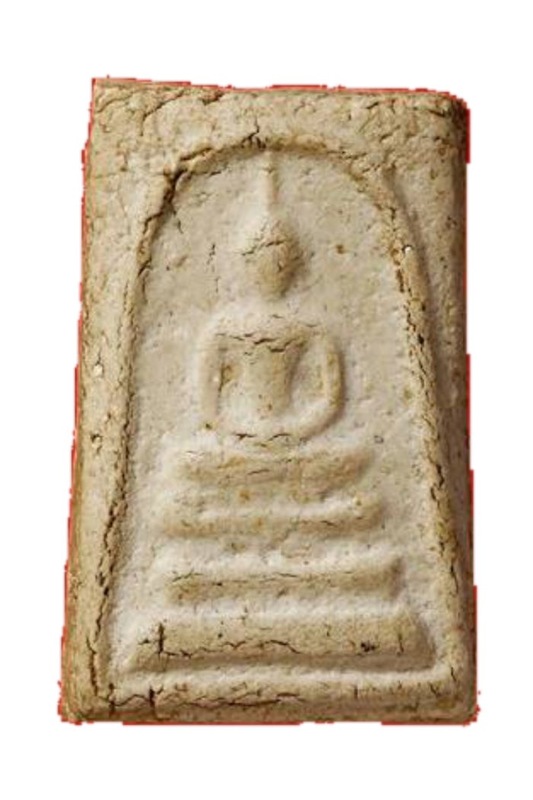 The Pra Somdej Bang Khun Prohm (Wat Mai Amataros) amulet. 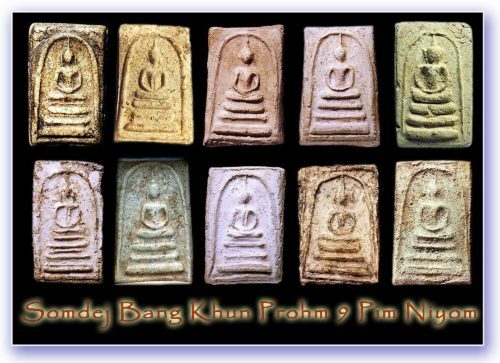 The above examples Of a Pra Somdej Bang Khun Prohm Pim Sen Dai (Kru Chedi Yai), are recommendable objects for reference study and comparison of the Muan Sarn content and Surface features. The clay has condensed and hardened and become shiny like a domino, from passage of time and atmospheric changes. This results in a very smooth surface, which reveals the various characteristics, tonal qualities and markings as well as particles of Muan Sarn present which are in extreme visible evidence. Ru Khem are visible in the rear faces of Pra Somdej Wat Bang Khun Prohm, as well as ‘Sanim Grapong’ – the red rust particles. The hardness of the amulet to the touch reveals its age. The downward curving lines of the lower double ‘Thaan Saem’ (split Dais model) are a perfect example of the features sought after in a reference model. The cracks are like deep crevices, showing the shrinkage factor of drying over long time periods. “Phiw Jantr’ – Moon surface. Not all of the Pra Somdej Bang Khun Prohm were placed in the Kru, it took many years to create and press them and many would be in a receptacle in the Kuti and would be handed out by him during the time he created and empowered them. This explains the absence of Kraap Kru, as well as being purely logical and the most probable chain of events to have occurred. The Thaan Saem is one of the 5 Pim Song of Pra Somdej, which exist in both the Kru Wat Rakang and Kru Bang Khun Prohm amulets. Pra Somdej Wat Rakang have Five major category of Pim Song, whereas the Pra Somdej has four more Pim Song, making it nine major Pim in all. History records that, in the year of the Dragon 2411, Samian Tra Duang Tongoses made restoration work Wat Bang Khun Prohm Nai (Wat Mai Amataros), and renewed the temple along with the building of a new Chedi Stupa, in order to place Pra Somdej amulets, which Samian Tra Duang invited Jao Prakhun Somdej Pra Puttajarn (Toh) Prohmrangsri, of Wat Rakang Kositaram to place there, as well as to empower. 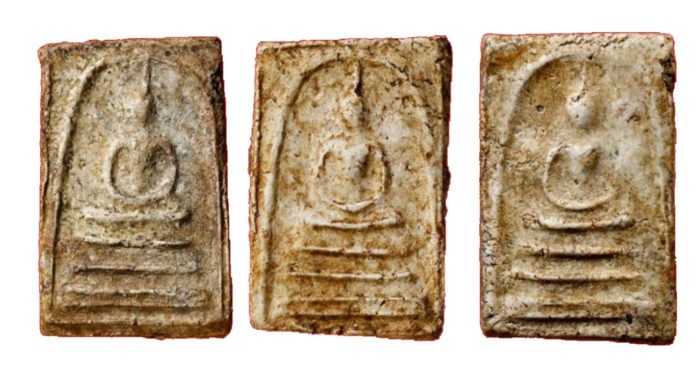 The amulets were made in the Somdej Traditional formula of 84,000 pieces (same as the number of suttas of the Pra Tammakhant). After Somdej Toh had blessed and empowered them, Samian Tra Duang was allowed to place then in the Kru hiding place within the Chedi Stupa behind the Upopsadha shrine room. 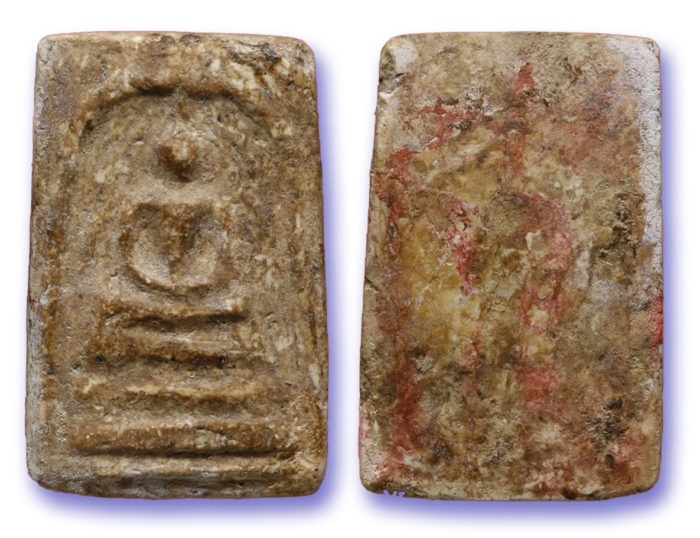 During the time from then, the Chedi was sometimes accessed and amulets were removed from time to time, and even some thieves dug holes and stole some. This became so bothersome that the Kru had to be broken open officially on 24th November in 2500 BE. The opening took all day, until at approximately 8pm, the very last Pra Somdej amulets were removed. Many of them were very thickly coated with ‘Kraap Kru’ (residues and growths). The amulets were allowed to be rented out by devotees, until the year 2509. The total amount of money raised from the rental of these amulets amounted to about 4 Million Thai Baht. 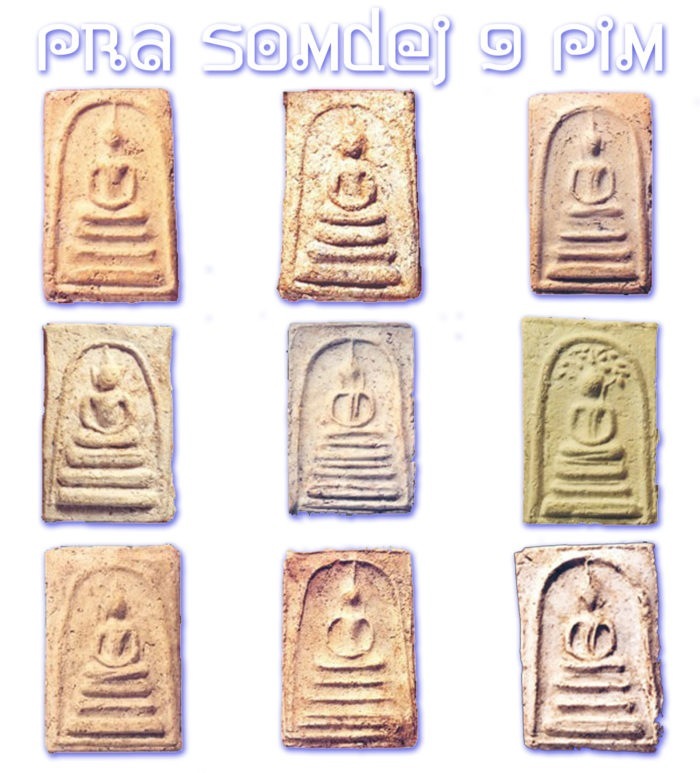 In that year of 2509, a new set of 9 different ‘Pim’ (models) of Pra Somdej amulets were created and released. In addition, a special Pim was released too, namely ‘Pim Saiyaas’ (Sayasana Buddha in laying down position). 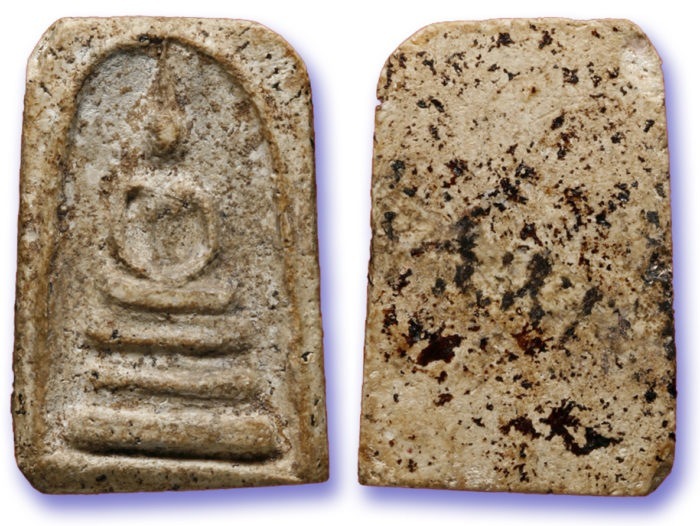 These 2509 edition amulets were made using broken pieces of original Somdej Toh Bang Khun Prohm amulets, as part of the Muan Sarn sacred powders. Once again, according to tradition of Pra Somdej making, 84,000 amulets were made. Apart from the Somdej Toh amulet pieces, broken amulets of Somdej Luang Ta Pan 2502 BE were also added to the mixture, and also from Luang Por Lampu, who both had used pieces of the 2500 BE Kru opening of the Somdej Toh Prohmrangsrit amulets to make their own Pra Somdej. were not rented after the ceremony on that day were then buried in the Chedi Stupa again. Because of the presence of Muan Sarn sacred powder from both original Somdej Toh amulets, and those from Luang Ta Pan and Luang Por Lampu, this edition recieved immense interest and popularity. This edition of Somdej Bang Khun Prohm, are considered to have extremely powerful Buddha magic in them due to the richness of sacred powders from great masters, and the fact that they are almost purely made from ancient Somdej Toh amulets. They thus carry Somdej Toh’s powerful blessing, just as if he had made them.